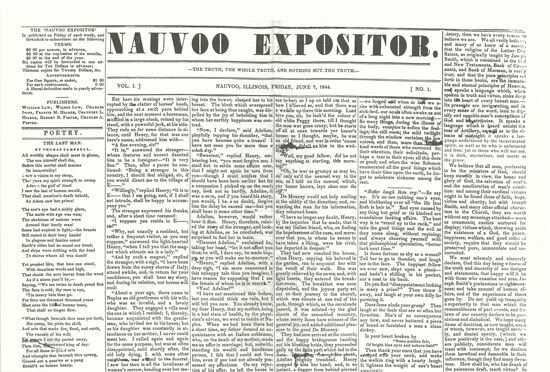 This is a 30" by 20" fold-out reproduction of the first and only issue of the Nauvoo Expositor, a newspaper started in Nauvoo, Illinois, during the time that Joseph Smith was the Mayor of Nauvoo, in addition to being President of the Church. After the Expositor's first publication, it was declared a public nuisance, and its printing press was destroyed. The Expositor aimed to expose Joseph Smith's teachings of polygamous marriage, and his polygamous marriage propositions to women who were already married. In addition, it also exposes Joseph Smith's teaching of a plurality of Gods, and his teaching of exaltation to Godhood.